Key earnings announcements from Wal-Mart, Priceline, and Restaurant Brands are on deck for the shortened trading week. With their Friday rally, stocks have decent momentum heading into the shortened trading week. The Dow Jones Industrial Average (DJINDICES:^DJI) and the S&P 500 (SNPINDEX:^GSPC) both fell by 1% last week, and are down about 8%, year to date. 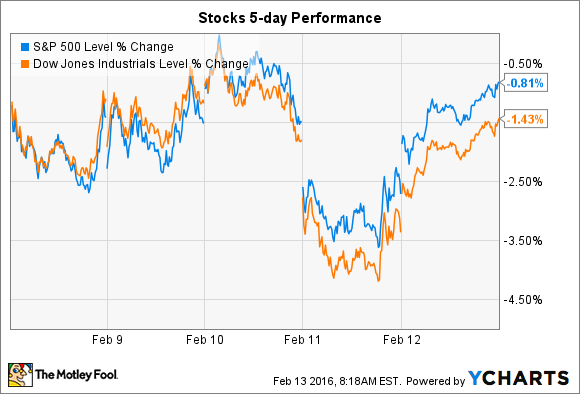 Markets were closed Monday in observation of the Presidents Day holiday, but fourth-quarter earnings season roars on after that. Restaurant Brands (NYSE:QSR), Priceline (NASDAQ:BKNG), and Wal-Mart (NYSE:WMT) are all stocks that could make big moves this week as they post their quarterly earnings results and provide updated outlooks for the year ahead. Restaurant Brands, the operator of Burger King and Tim Hortons restaurant chains, will post its latest earnings numbers on Tuesday morning. The stock has dramatically underperformed larger rival McDonald's (NYSE:MCD) lately, as the fast-food titan just returned to strong sales growth thanks to a popular shift to all-day breakfast. But even late-night pancakes couldn't lift Mickey D's results past Burger King's recent comparable-store sales growth, which clocked in at 6.2% in the third quarter compared to McDonald's 5.7% Q4 bounce (Burger King had help from hit innovations like chicken fries). The rivalry between these two companies promises to only get more intense as Restaurant Brands aggressively expands the Tim Hortons brand into the United States, which management calls a "must-win" market. Travel booking giant Priceline is set to post earnings results on Wednesday morning that show a healthy jump in both top- and bottom-line numbers. Sales should rise 6% as profits improve by 9% to reach $11.81 per share. Priceline's growth is stronger than those figures suggest because foreign currency shifts are holding down reported results. The third quarter's 7% gross bookings uptick, for example, becomes 22% after accounting for exchange rate moves. Similarly, profits would have risen by 29% absent that temporary headwind, as opposed to the 12% increase Priceline announced . The company expects growth rates to slow in the fourth quarter, declining to a 16% improvement from Q3's 22% jump. Looking further out, management is encouraged by the fact that, despite their leading market position, Priceline still only accounts for less than 10% of travel industry bookings. After trailing the market for years, Wal-Mart is currently the best-performing stock in the Dow so far in 2016. The retailing titan's shares are up 7% heading into this week's earnings release, compared to a 10% drop in the broader index. Some of that outperformance is likely driven by investors' attraction to its sturdy business -– and hefty 3% dividend payout -– during this time of market stress. But the retailer has also shown signs that its operations could be gathering momentum. Comparable-store sales rose by 1.5% in the U.S. market in the third quarter, marking Wal-Mart's fifth straight quarter of positive comps. That boost wasn't powered by higher prices, either, as customer traffic increased by almost 2 %. Overall profits fell significantly, though, declining 5% on a constant-currency basis, and that's a refrain that shareholders will see again as Wal-Mart spends heavily on raising wages, investing in e-commerce capabilities, and improving the in-store shopping experience. The big-picture goal is to become the first retailer to deliver a high-quality shopping experience across traditional and digital sales channels at a huge scale. We'll know if Wal-Mart made progress in that direction if its customer traffic trends continued to improve during the highly competitive holiday quarter.